Modern clogging comes from a rich tradition of music and dance. 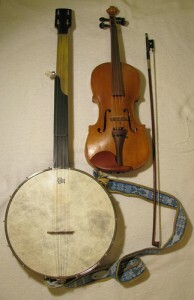 Like many American art forms, it is somewhat of a folk alloy, combining elements from different cultures and creating a new folk tradition that is uniquely American. 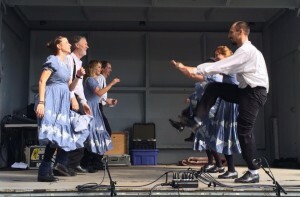 The type of clogging performed by the Wild Goose Chase Cloggers is often called “team clogging” or “precision clogging”. It is usually done with a group of people. You’ll see us perform dances with anywhere from 2 – 12 dancers. Many of the patterns we dance come from traditional 4-couple western square dance figures. You’ll also notice that our dances are choreographed so that all of the dancers are doing the same dance step at the same time. There are many precision clogging “teams” or groups active across the nation. Clogging is done to many different styles of music including modern country, bluegrass, old-time, and hip-hop. The Wild Goose Chase Cloggers perform with a live band that plays Old-Time music. Old-Time music has a tradition as deep and rich as the dancing it drives. 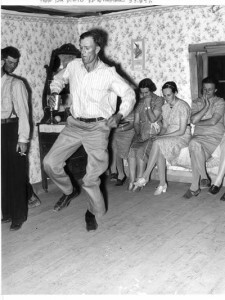 It is the music that you are most likely to hear at square dances. It is music that is meant to get hearts racing and feet stomping. The bulk of the tunes played in old-time music came to America with the early Scotch, Irish, and English settlers. The solo fiddle tunes of these traditions spread through the Appalachian Mountains along with the early settlers. During this period African culture and music was making its way from the slave fields and plantations into the margins of American music with highly percussive and syncopated music and dance styles. One result of this was that the European born fiddle met the African born banjo. It was love at first sight. The driving rhythmic and percussive nature of the banjo supported and augmented the dance tunes being played on the fiddle. The marriage of the fiddle and the banjo gave birth to Old-Time music. As in any marriage, extended family is bound to get together eventually. Sometimes they hit it off, sometimes they don’t. It happened to work in this case. Both musical traditions came complete with accompanying dance forms. The Anglo settlers brought over jigs, reels, hornpipes as well as steps supposedly developed by the wooden-soled shoe wearing factory workers of old England. Stories suggest the workers held dance contests on the cobblestone streets during lunch breaks. The African culture brought a rhythmic dance style that was performed with feet kept lower to the ground and a freer, more relaxed upper body. These two dance styles intermingled and a new dance style was born called “buck” dancing or “buck and wing” dancing. This was primarily a solo dance form that was improvised to the music. The development of old-time music and buck dancing, like many folk arts, is hard to trace but the birth of modern clogging is not. It began in North Carolina in the 1920s. Sam Queen and his Soco Gap Dancers combined buck dancing with big-set appalachian square dance figures and modern clogging was born. In this style of dance the group would dance the square dance being called by one of the dancers. Each dancer would perform freestyle buck dance steps as he or she performed the figures called out by the caller. The Soco Gap Dancers were one of the first groups to bring this new style of dancing to the broader public. Other groups began to form and by 1938 team clogging had its own competition at the Bascom Lamar Lunsford Festival. The Soco Gap Dancers were invited to perform at the White House in 1939 for the visiting Queen of England. Queen Elizabeth is reported to have commented that the dancing was “just like our clogging”. The term clogging is said to have originated from that episode but was likely in use before then. But there is no question that the term stuck. It is with us to this day. It wasn’t until the 1950s that the groups began to choreograph preset step patterns to be done by all of the dancers at the same time. This was the birth of “precision clogging” and what is performed by most clogging groups today including the Wild Goose Chase Cloggers. The most recent influence on clogging comes from the Green Grass Cloggers of North Carolina. The enthusiastic founding members of that group incorporated new steps into the dances that they had learned from local old time dancers and several that they made up themselves. Their style features some showier steps with higher leg movement and choreography that was based on 4 couple western square dance figures. 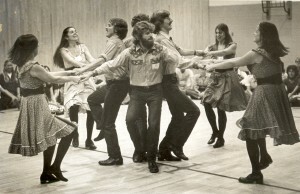 It was a visit to Minnesota by the Green Grass Cloggers in the 1970s that inspired a few local dancers to learn clogging. They eventually formed the Wild Goose Chase Cloggers in 1979 and the Geese have been dancing ever since. While most of our dancing is precision clogging, we deeply appreciate and enjoy the solo, improvisational dancing that helped give birth to modern clogging. So we always program time into our shows for each dancer to do some freestyling. All of the Geese are thrilled to take part in this living tradition. We truly love what we do and you’ll see that on our faces if you come to one of our shows.